ROS C Turtle has been released! ROS C Turtle is the second ROS distribution release. ROS Box Turtle was released March 2, 2010 and included stable releases of ROS and core libraries and tools like navigation, rviz, hardware drivers, and an image-processing pipeline. 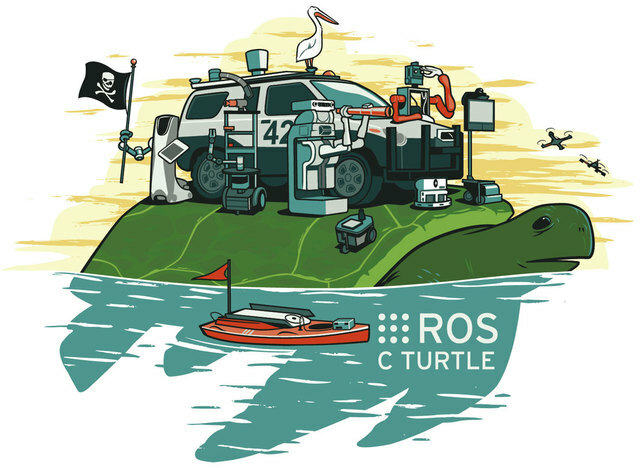 ROS C Turtle builds on Box Turtle with across-the-board improvements to these core libraries and numerous bug fixes. These improvements include a new "nodelet" architecture that provides low-latency, zero-copy message passing within C++ nodes, official support for a Lisp client library, and an official firewire camera driver (thanks to Jack O'Quin). Numerous third-party libraries have been upgraded in this release, including Stage 3.2.2, Bullet 2.76, and Eigen 2.0.15, as well as newer versions of KDL and Gazebo. There are many, many other improvements listed in the change list. This release includes new experimental libraries for 3D perception, manipulation, grasping, and visual odometry. We encourage early adopters to test out these libraries and provide feedback so that they can be stabilized for future ROS releases. Since the release of Box Turtle, the ROS community has grown immensely. There are over a dozen new public, open-source repositories of ROS code, and ROS has been ported to a variety of different robot platforms, from mobile manipulators to autonomous boats. Commercial robotics software libraries like Urbi and Karto now have open-source offerings that are compatible with ROS, and the list of robot platforms that can be used with ROS continues to grow. We're excited at these new opportunities to collaborate within the community and hope that you all enjoy this C Turtle release. ROS distribution releases occur on a six-month cycle. The successor to C Turtle, Diamondback, is expected in February of 2011.